Berechnung der Luftmaschine, welche in der Niederungarischen Bergstade zu Schemnitz bey der Amalia Schacht, vom Herrn Joseph Karl Höll, Oberkunstmeistern erfunden, erbauet, und im Jahre 1753. den 23. Martz ist angelassen worden. Schemnitz (now Selmeczbánya) in Lower Hungary is an ancient mining town which produced silver, gold, lead, copper and arsenic. It is sited in a deep gorge in the mountains and from the mid 18th century, Höll, the chief mining engineer of the district began to exploit the natural advantages of this location to drain the deep shafts using 'water piller' pumps (Wassersäulenmaschinen) , where a high head of water under natural pressure would be used to dewater the bottom of the shaft. Höll built the first pump in 1749 to drain the Leopold Shaft. The pump described here drained the Amalia Shaft and was started up in 1753. It was the second of Höll's pumps and was considered to be an improvement over the first, working even more simply and effectively. 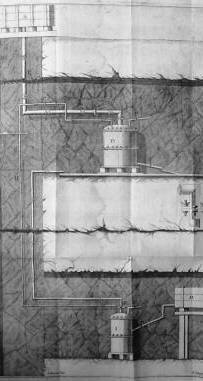 It took water from a spring 140ft above the mouth of the shaft to drive water to the surface from the bottom of the shaft, which was 104ft. Boda taught mathematics at the famous academy of mining and forestry, founded in Schemnitz by Maria Teresa in 1760 and must have had first-hand knowledge of these pumps, which were quickly used in mines all over the Austro-Hungarian Empire. In 1771 he published in Prague a comprehensive work on them, 'Beschreibung der Schemnitzer Bergbaumaschinen' . This scarce little book, which contains a good plate and all the details of the Amalia pump, including records of its working, may have been extracted from the larger work but is clearly a separate publication in its own right with a Vienna imprint. Small 8vo. 47 + (1)pp, 1 folding engraved plate with light damp-stain on left-hand side. Marbled boards.